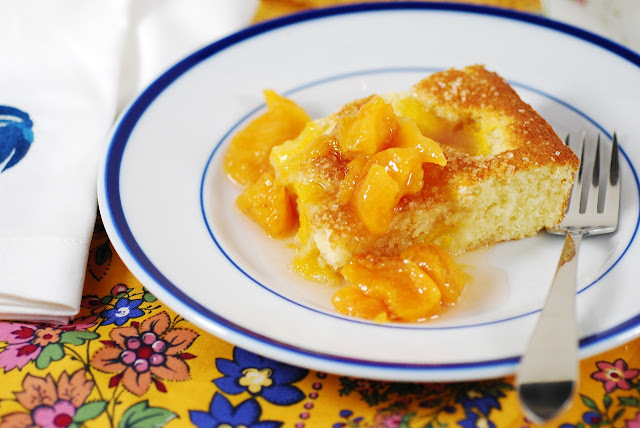 Here are a couple more ways to use fresh peaches: Peach Almond Cake with Peach Compote, and Poached Peaches with Blackberry-Cassis sauce. I've been enjoying the Summer, and I hope you have, too. The garden is out of control, and pattypans the size of dinner plates are emerging from the foliar depths. The Zucchini Festival was held today over in Ludlow, and I thought the pattypans would fit right in. Being more spherical in shape, they would work better in the Zukapult contest. A couple of months ago, I passed on buying a downsized trebuchet on Craigslist, which I now regret. We could have used it to launch corncobs, rather than put them on the compost pile where Heidi can get them. For some reason, the wild animals have better manners about this than we have been able to teach our puppy. 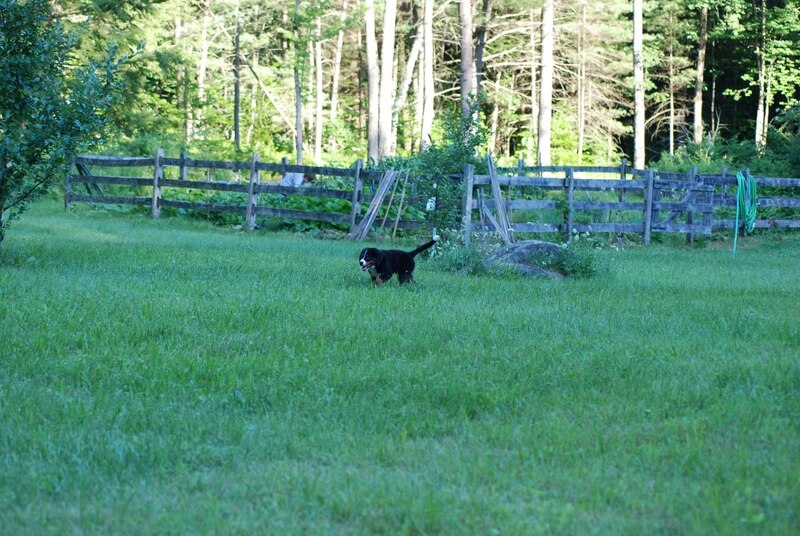 The bears leave the blackened, rotting corncobs alone, while Heidi grabs them and runs all over, with us in hot pursuit. 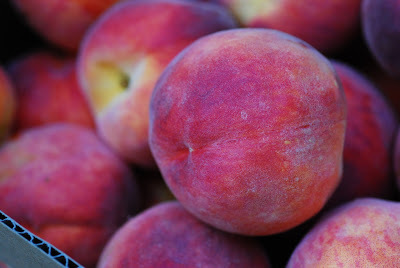 However, I'm working away at my bushels of fresh peaches in between corn cob sprints. Heidi had a bath today and is more subdued, perhaps contemplating her 4-month crime spree. Or, maybe she's just tired and is recharging. Optional: Sparkling sugar, to be applied during bake cycle. 1. 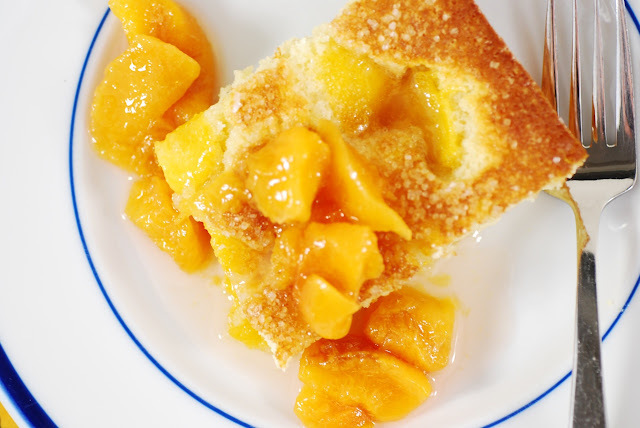 Place the peach mixture in a saute pan, and cook over medium heat for 10 minutes, until peaches are tender and syrup is slightly reduced. Split this into two separate bowls; half will be used for the cake, and half will be the topping when served. 2. 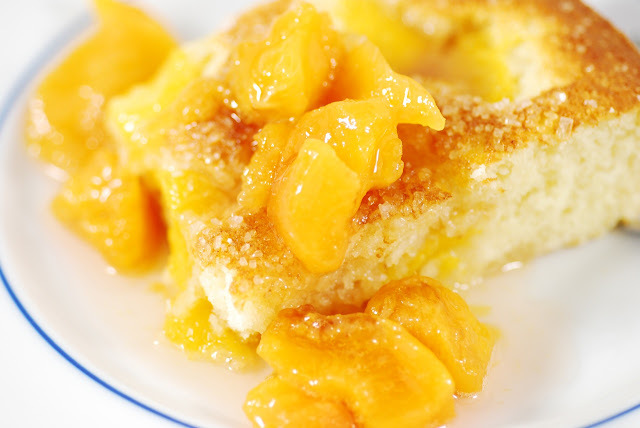 In a food processor bowl with blade attached, place the flour, baking powder, 2 T corn starch, almond flour, sugar, and salt. Pulse until combined. 3. Add the melted butter, pulse until combined. 4. 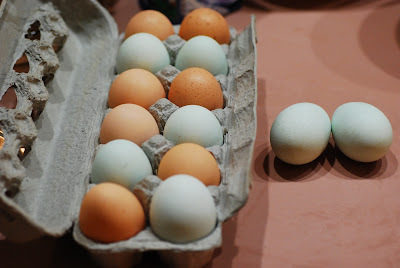 In a small bowl, whisk the eggs, milk and vanilla. Add to the food processor bowl, process until combined. 5. Scrape batter into prepared brownie pan. 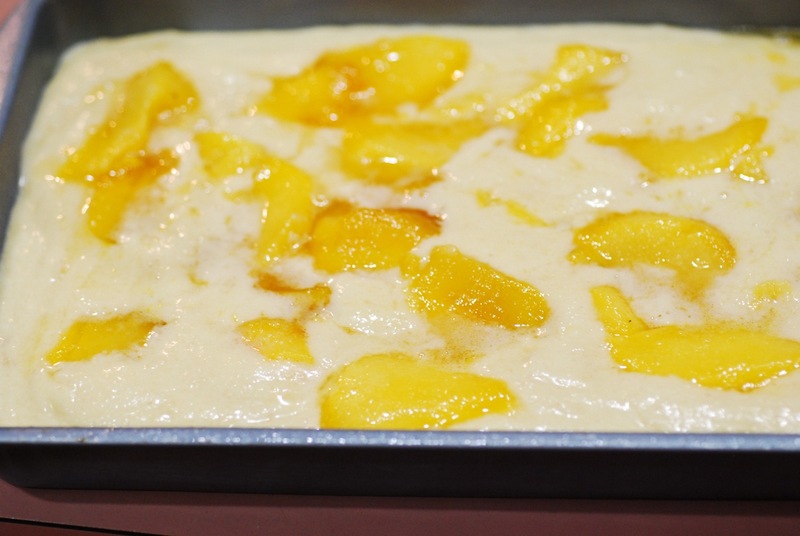 Take one half of the cooked peach mixture and scatter on the surface. 6. Bake: Place in preheated 350F oven and bake for a total of 25 minutes (Optional step: Sprinkle with clear decorating sugar after the first 7 minutes, then continue baking). When done, cake will be golden and a wooden toothpick inserted in the center comes out clean. Remove from oven and place pan on cooling rack. 7. 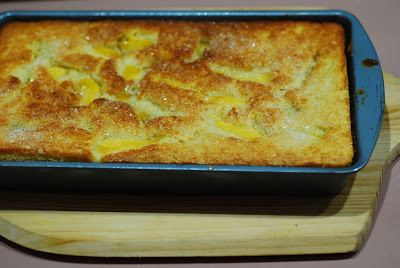 Cool to lukewarm, and serve with Compote and (optionally) whipped cream or ice cream. Enjoy! 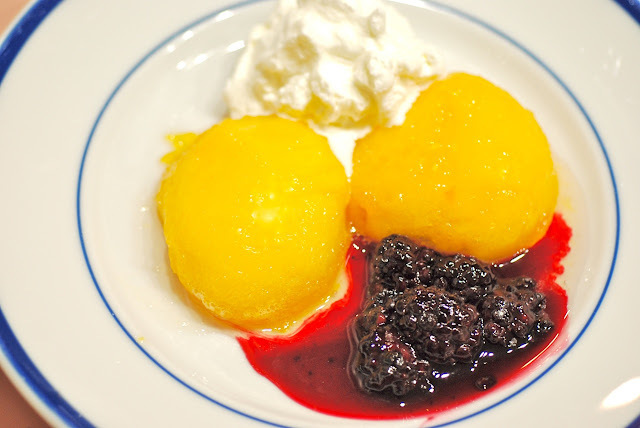 If you are pressed for time, and you have really excellent peaches, make a quick poach, finished with a bit of excellent white wine, accompanied by a contrasting Cassis sauce and ice cream or whipped cream. It's easy and delicious. 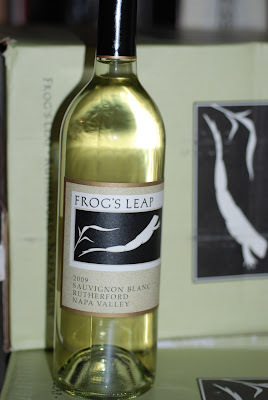 About the white wine: We recently attended a wine dinner at the Norwich Inn, featuring Frog's Leap wines. We met John Williams, owner of Frog's Leap, who explained the history of the winery (most amusing!) and the way that the wine is made. These terrific, organically-produced wines have been developed to control the alcohol content while providing peak flavor. This of course makes them superb to cook with, if you can steal a bit while they're being poured. 1. In a medium-sized, nonreactive saute pan, combine the sugar and water. Boil to make simple syrup. 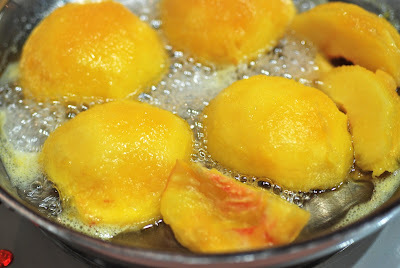 Add the peach halves and white wine, and saute very gently for about 10 minutes, depending on the size of the peaches, turning a couple of times. The peaches should be tender to the center. Remove from heat. 3. 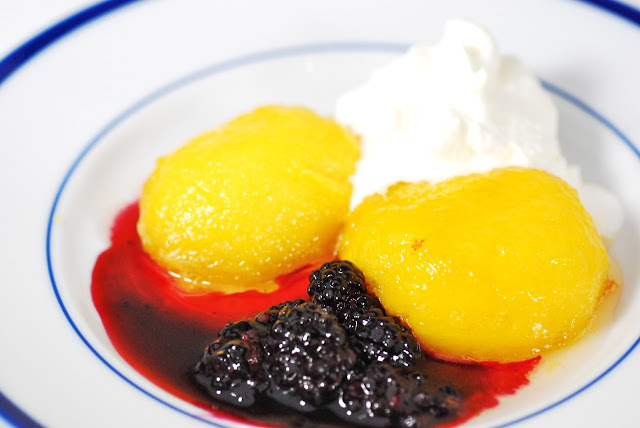 Serve plated with peach syrup, Cassis sauce, vanilla ice cream or whipped cream, accompanied by the rest of the Frog's Leap.